Imposing a severance tax on natural gas producers. The thinking is that PA already pays a severance tax to big oil producing states at the gas pumps but PA doesn’t do the same for the rest of the country when it comes to natural gas. The money will be used to address the impact of shale oil drilling and to fund education. The personal income tax is going up. The corporate income tax is going down and then down again, while tax loopholes will be cut. Education budget will be restored. Community colleges will get $15M. State colleges will get 50% of the money back from previous cuts with the provision that they must not raise tuition and that funds must go to classroom spending, not more administration. State education funding formula to be revised to direct more money to rural schools. 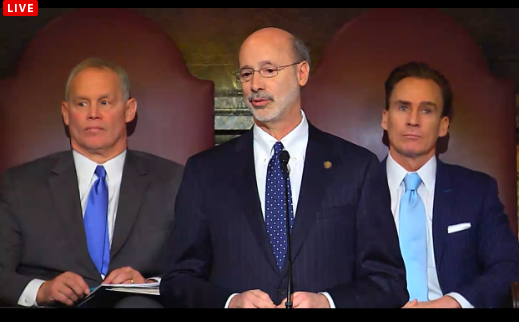 Money will be used to incentivize new businesses to come to PA and to restore four years of cuts to education. Wall Street money managers of PA pension funds will be dismissed. Savings estimated to be $1.2B over 5 years and underfunded pensions should be covered. There’s a $10B deficit in the pension funds that will be under new management. The State’s minimum wage will be increased to $10.10/hour. Well, provided R’s vote for that, which they might not. I would have asked for a minimum wage of $15.00/hour and let the legislature fight it out. So, there you have it. If you live in PA, your property taxes, which increased by something like 50% when Corbett was governator, will be going back to normal. If you earn more money, you’ll pay a smidge more. If you are a corporation, it’s all you can eat.